It occurred to me that I write too much. The thing is, I have lots to say and many ideas. The idea of making the visual notes was to consolidate my thinking and clarify my thoughts, yet it seems to open many doors to new forms of thinking. My head is like the internet, a web connecting one thought to the next; to a TED talk, an image, a quote, blog post, conversation or link on Twitter. I am juggling many thoughts and ideas this week and wondering how to balance it all. Imagine 28 tabs open all at the same time- that’s my mind. Have teaching and learning changed with the introduction of new tools? Whilst reading the final part of “Living and Learning with New Media” (MaCarthur Foundation) and Marc Prensky’s “Shaping Tech for the Classroom” on Edutopia I was reminded of Ken Robinson’s “Changing Education Paradigms” RSA animate. We teach in an intensely stimulating world and students are easily distracted from what Robinson calls “the boring stuff”. We need to engage them and understand their world, find out what motivates them and how to incorporate this meaningfully into our lessons without losing the grip on what and why we are teaching this. In a world of distractions to us adults too, I find this choice a minefield! Ken Robinson pinpoints that in The Arts students are fully alive, operating in the present moment and that through art, dance, music and drama their senses are on full alert “operating at their peak”. “We should be waking them up to what they have inside of themselves”. How can we do this? What have I done recently that “woke them up”? It seems to be a sad fact that students become less imaginative and lose creativity the further they rise up the school. In kindergarten, students have multiple ideas for any given theme, yet as they move through Middle School they seem to lose this, “as they become more educated, so creativity deteriorates”. Education knocks it out of them. This week I decided to jump on the imagination bandwagon with Matt McGrady in sharing drawing prompts with my MS art classes. In a nutshell, I start the lesson with a 5 minute observation drawing to literally warm students for doing art up yet calm them down ready for the learning ahead. (adapted from Marvyn Bartell‘s warm up ritual). Matt decided to shake things up a bit and connect with other teachers through Twitter and suggested an imaginative drawing prompt. So from Monday morning my students were given this: From unicorns to doughnut factories, hot air balloons and fire breathing dragons they let their imagination run wild (and thoroughly enjoyed the freedom of choice to boot). 5 minutes wasn’t long enough for them, yet it was crucial there was a time limit (we had other work to do too!). But at the end of the 5 minutes it felt hugely important to them to talk about their drawing. So instead of letting them just explain, I tipped it on its head. Using one of Howard Gardner’s Thinking routines (Visible Thinking), the artist remained silent for one minute whilst their partner spoke about what they see, think and wonder. It was hilarious to watch their faces and they were itching to share what they were communicating and the idea behind their drawing. It had truly woken them up, yet had also given them an effective strategy to discuss artwork. So, how can I effectively incorporate technology in the same engaging and motivating way, yet keep the essence of the learning at the forefront? Students love to be in control, or at least to think they are in control of their learning. We owe it to them to include them in the planning, the preparation and the process. In order to effectively integrate technology we must first consult the students – what do they use, how best do they learn, what is their passion? It is through these conversations that we unravel what it is to be a middle school learner. In an education world where personalised and Individualised learning is becoming far more necessary we, as educators must search for ways that help students to learn more effectively. But are we using technology to do what we would have done but in a different way. Prensky highlights the change in our approach from dabbling to innovative methods of incorporating technology into the classroom in a similar way to Blooms Higher order thinking. It was through visualising this process that my mind started to wander into thinking about what we actually do in terms of technology in the art room and is it transformational? As we integrate more technology into our lessons, we need to bear in mind that “it’s not about the device anymore but it’s about the learning going on” (Dana Watts, COETAIL livecast February 11th 2014). In what ways are we trying to redo old things but in new ways? Are these methods valuable as we discover what technology and tools work in today’s classroom and as we experiment with new media? What is new media today? Collaborating on Google docs, connecting through Twitter, communicating and sharing on student blogs, offering feedback on Picasa. Are these helping to integrate technology effectively and with the desired effect on student learning? One way I found that can help develop our thinking is to read Kathy Schrock’s “Bloomin’ Apps” article. 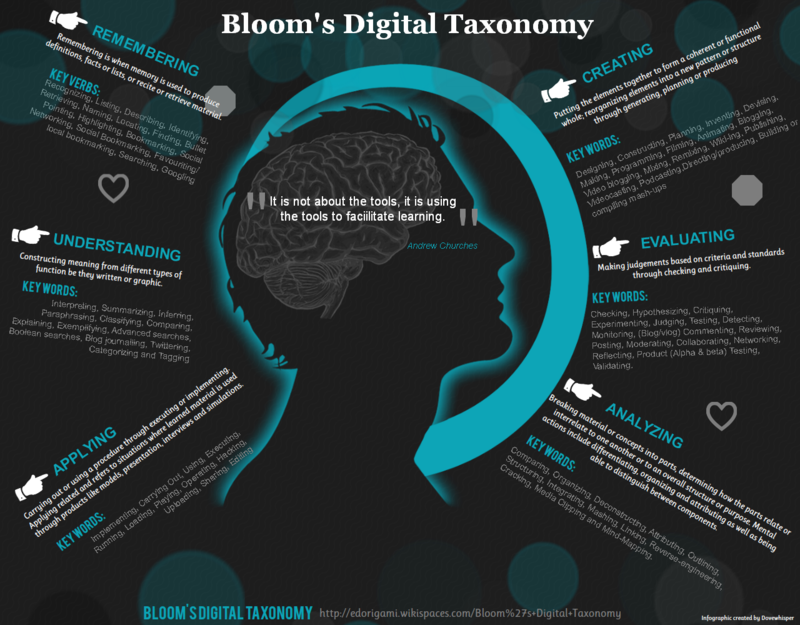 She shares multiple suggestions in which technology can be used to support Bloom’s Revised Taxonomy as well as making the crucial link with the SAMR model. Visit the site to see how she visualises which types of apps are best used at which phase in the thinking and it is invaluable as a check for how learning is enhanced by technology. In my Global concerns group PAW (Promoting Animal Welfare) we meet once a week through lunch for 30 minutes to discuss and find ways to share and learn about animals in danger and students have recently been sharing their PAW passion through a google presentation in order share with the group for a 2 minute “Spotlight”. It seems like a new way to do an old thing so we started to discuss new ways to communicate and engage others in their learning: stop motion, video scribe and animated RSA style visual notes and an ebook to capture their ideas, communicate and share with the community. One 12 year old is developing an app and a group is planning an ebook to share their findings and communicate their concerns with their peers and the community. Surely this is heading in the right direction, isn’t it? So as usual, I am left with a question – why use technology in Art when traditional media will work just fine? I am faced with this quandary on a daily basis – when is it authentic, useful, worth it? How do we balance the traditional skills with the new? And so to my planning project, the one about Sustainability, collaboration and connecting. As Sir Ken said, “collaboration is the stuff of growth”. We learn best when collaborating. 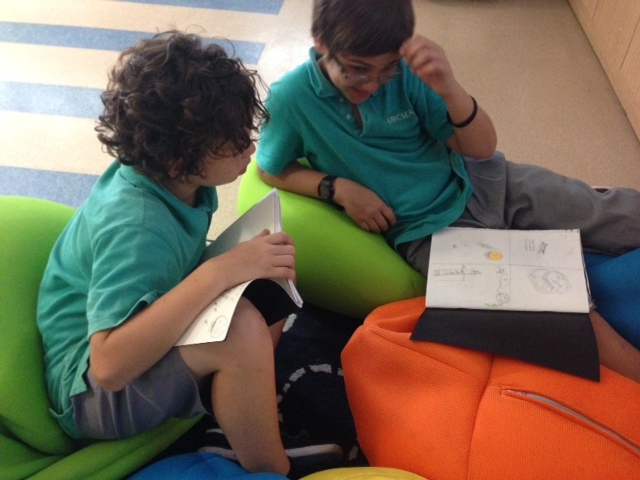 Students love working with others, “hanging out” and “messing around” with ideas and sharing direction. I want the project to centre around working together to discover, develop and communicate. As it is a difficult subject to research and students may have only a little prior knowledge, we will start collaboratively using Padlet to brainstorm ideas and harness the knowledge in the room. I want students to reach out into the Twitter community and connect with organisations and experts who can help them discover where the food on their plate comes from, hence the title “Food for thought”. Through this process I am hoping they will make connections and find new ways to feed their imagination and find out what they want to communicate through their Art. As their ideas start forming for their installation work I am hoping they will feel compelled to communicate their findings through a short PSA style video and to share this through Youtube. As my plans begin to solidify, any feedback on the process or the development along the way would be very gratefully received! Just what are we doing differently than before – how are you developing new ideas from new things? or are we just doing old things in new ways? Has my teaching changed – it has, it is and it will, but it will take some time, investigation and experimenting to find out what works best and what will be the most effective. In the mean time, I’m having fun trying! Hi there. Great post. Just happened to open Coetail as you posted it. You leave me with so many questions. I too am, on a daily basis, wondering about the old and the new of the art work. My biggest and latest conundrum is the IWB for the DP. Being that no examiner comes anymore to see the entire workbook should the students do it digitally? I am sure some teachers are encouraging that but for me there is something about having those physical books for 2 years. I bet it is how a writer feels about a book vs. a Kindle. I think that next year I will give the students the option of doing it all digitally. Do you know what your DP teachers (John) do? What about you and developmental workbooks for the middle schoolers? In your photos the kids have paper. Is it just so hard for me because this is how I went to school, using traditional tools in art and the future art teachers will not even think twice when everything is digital? Back to more reading and visual note taking! Hi Ann, Thanks! At the moment sketchbook are all hand written, I think it is a cultural thing that it has always been and it works. All students have laptops but I think until iPads are introduced as mainstream for notetaking kids will always either hand write directly into the sketchbooks or type up analysis (urgh!). I do value the hand written pages which seems contradictory to my passion but as anything change takes time. I am introducing visual note taking int he middle school with Humanities and English first as they have most leverage for it and time to spend on it in class. Who knows next! The actual process takes ages to master (as my past notes will prove) and it may be something we just don’t have the time to teach in Art at the moment, which is a shame as they have most to gain from the process. I am introducing the notion of visual analysis much more with Grade 8 and then lower down as the need arises but in traditional format. I look forward to seeing your DP examples – Tweet them please? It is a huge quandary we are faced with between continuing the traditional side to our subject and yet embracing the new. I am sure there is not one answer to this or one teacher that has it all worked out! If there is, let us hear it! Thanks for sharing all of those great videos. I know our visual arts teachers (and others!) will love them. I like how you are approaching the use of technology in your curriculum through the collaboration angle. The greatest takeaway from COETAIL, I hope, isn’t the latest and greatest tools but the network that it helps you to build. Teaching our students how to build and harness their own networks, for both formal and informal learning, is so powerful! very true Clint. As it stands I am learning so much through the network and close posse I have found and reached out to here. I hope that the same works for my students over time. Thanks for a thought-provoking post! I agree that allowing students a bit of free thinking time at the beginning of a lesson or activity might be a great way to get their creative juices flowing. I’ve been thinking about starting each day off with 5 minutes of free writing in order to help stimulate thinking/slough off any residual emotional baggage students may have had before arriving at school. I’ve begun using Padlet and Haiku Deck increasingly in my lessons. I love being able to have a record of the class discussion, plus of course the fact that Padlet allows you to hear from every student – even the quiet ones. I think that teaching such a visual subject like Art must allow for a beautiful marriage between the topic and the technology with which to present it. As for keeping a sketchbook, I recently downloaded the SketchbookX (Express) app which I am beginning to experiment with. Still need to decide whether it has the capacity to replace paper and pencil though. Thank you Susan! I love the idea of your 5 min free writing, it would be fantastic to see what they come up with free choice! Have you ever done the 50 word story challenge? Very fun and engaging. I have even seen a six word (!) challenge. Padlet is a great resource as is https://todaysmeet.com/ to bring out the voice in everyone. I have used it in a Harkness table context and it is very powerful. I use my Adobe Ideas on iPad so much more than I thought i would. I still love the feel of pencil on paper but the versatility of the iPad is brilliant (and I can back step, zoom, trace and erase! I would love to see your experiments! hashtag #visualnotes on Twitter and let me see them! Nicki – let me just say – I have really come to enjoy our collaborations so far. It has spurred a resurgence in my twitter activity and opened some great new entry points to teaching and learning. Thank you for this. As Clint notes above – it is the human connections through the technology that will matter most. Connecting with you and your class has given my class a great sense of purpose when we enter into the room. There is a sense that something big is happening among my students. We are a small group in Painting and Drawing class and they enjoy the fact that there are so many other people getting a glimpse of what they are doing these days. 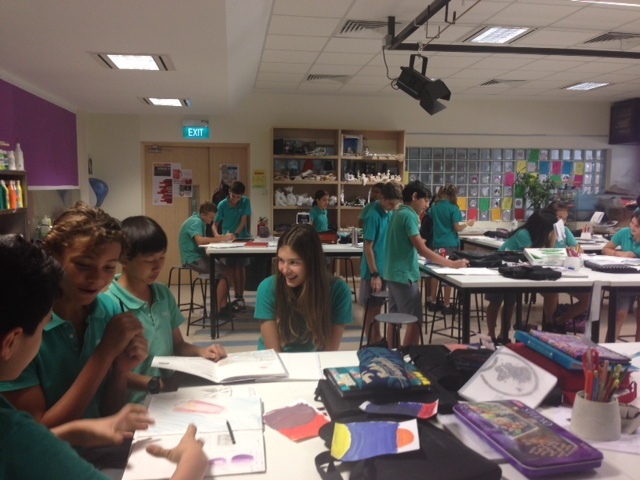 We are currently working on taking cues from our favourite books and creating 1 and 2 point perspective drawings to illustrate the same scene in two different ways. Very cinematic. We will post them when they are finished and would love to hear your class’ feedback if possible. Thanks Matt – me too, the kids have loved “becoming famous” across the world through Twitter! I wondered whether we can work out a good way to download, remix and share the art for #artyremix? Suggestions so far are still dependent on participants giving me their email, which I would like to avoid: Pinterest shared board, if they join Pinterest might work. What do you think? I love the perspective/literature link – I really look forward to seeing their drawings. Maybe we should start a FLickr group? How do other people share images simply so that all can join in? Google? Interesting you would cite the Ken Robinson video “Changing Education Paradigms.” I remember viewing it some two years ago, and just saw it again the other day (it was a trailer after Jeff’s link to “When I Become a Teacher” video). Aside from the fascinating format of the video and the expansive “mind map” quality of it (something I think you certainly share a talent with as well), what registered with me was Robinson’s brief digression on children being over diagnosed and medicated for ADHD. Here, “technology” of a different sort — pharmaceutical — is working to “quiet, calm, and bore” students effectively working at cross purposes to the digital technology being embraced in schools that attempts to stimulate learning. Thanks you so much for taking the time to read my post. I certainly agree with you that the idea of medicating them is awful and it really stood out for me in the video. Thanks so much for the compliment and I don’t think for a second that I have anything near the talents of the RSA animators! They are truly awesome visual captures aren’t they?